The current Worpress blog will no longer be updated and will cease to exist after Dec 31, 2008, so be sure you update your links! Head on over to the Media Center at MoosePeterson.com and check out his series of free online videos covering various topics relating to the D3, SB-800 flash and NX2 software. Nikon has just announced a new low-light prime lens, the AF-S NIKKOR 50mm f/1.4G. This latest addition to the NIKKOR lineup features a large maximum aperture of f/1.4, enabling it to be used for easy handheld shooting in dark settings, such as a dimly lit room. It also allows photographers to easily create beautiful large blur effects. The lens’ Silent Wave Motor (SWM) ensures quick, quiet autofocus. Autofocus shooting is made possible with SLR models that do not have a built-in motor, such as the D40 series and D60. 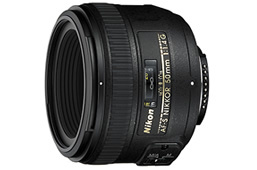 The AF-S NIKKOR 50mm f/1.4G is a high-performance large-aperture, single-focal-length lens especially suitable for professional and advanced amateurs who use Nikon FX-format cameras such as the D3 and D700, and frequently shoot human subjects as well as night landscapes and astronomy. What’s more, when attached to a DX-format SLR, this f/1.4 lens with 75mm equivalent picture angle is capable of shooting portraits with beautiful blur effects.